Nov. 22, 2015 - Pastor Ted Continues the countdown to our final Sunday at our campus here at 12000 W. Fairview Ave. Don't miss any of these last four weeks of inspiring Vision casting as we prepare for a move 40 years in the making. Our last Sunday here will be our final Christmas Candlelight Service on Dec 20th. Make plans now to be there. Nov. 15, 2015 - We only have 5 weeks left! Pastor Ted Continues the countdown to our final Sunday at 12000 W Fairview Ave. Don't miss a single week of inspiring Vision casting as we prepare for a move 40 years in the making. Oct. 25, 2015 - Pastor Ted continues the countdown to our final Sunday at our current Location. Don't miss a single week of inspiring Vision casting as we prepare for the move to our future location that's been 40 years in the making. Oct. 18, 2015 - Pastor Ted Starts the countdown to our final Sunday at our current Location. Don't miss a single week of inspiring Vision casting as we prepare for a move 40 years in the making. Aug. 16, 2015 - Have you ever had the chance to headline with Jesus and passed it up? Only to realize you had missed the opportunity after the fact. Jesus is calling us to partner with him and to headline with him every day, and yet too often we miss our opportunities to be a people prepared to give an answer to others about the hope that we have in Him. Too often we miss the little miracles that God has prepared in advance for us to be a part of and miss the opportunity to headline with Jesus. Pastor Ted's message this week is one that inspires us with the story of a little boy who, by simply sharing his lunch, got to headline with Jesus and be a part of the only miracle mentioned in all four gospels. Don' t miss this special message that could set the course of your day today and everyday. Don't miss your chance to headline with Jesus. We are living the Miracle. As we have been traversing the last three years as a church God as meticulously guided each step of the way. Pastor Ted shared in this weeks message about living in the middle of a miracle and how sometimes we fail to see it because we are so close to the reality of our situations. In the ups and downs of preparing for the sell of our property, the chapter 11 bankruptcy proceedings, the purchase of our new campus and every turn in the road along the way, God has been faithful and has provided in ways that only he could have dreamed up or put together. Don't miss this incredible, inspirational message about not only our current situation as a church but about how our God works miracles all around us. Are you living the Miracle. Like trees, we can (if we are not careful) find ourselves rotting from the inside out. We begin to allow disease to spread unchecked and just as in the life of a tree, unchecked disease will destroy our FAMILY TREE in much the same way. Pastor Ted tackles a very serious and difficult topic this Sunday that affects more families than we often want to admit. In fact by some estimates it affects anywhere between 60-80% of all families. Hear what God's word has to say about how you can keep your family tree healthy and strong. We live in a culture that celebrates the fairy tale. Everyone has that perfect princess or prince charming that is out there, we just have to find them. We quickly buy into the notion that once we find Mr./Mrs. right our relationships will begin charting a course of smooth sailing. Yet sadly culture's reality tells us a different story completely. What if God's plan was not to find the right one but instead to BE the right one? Pastor Ted continues in the Love where you live series talking about Names. What we are called and call others matters. In Scripture a name meant a lot and so this morning we look again at the story of Jacob, Leah, Rachel and their sons as we discover that God has called us to Re-Name some things in our lives. 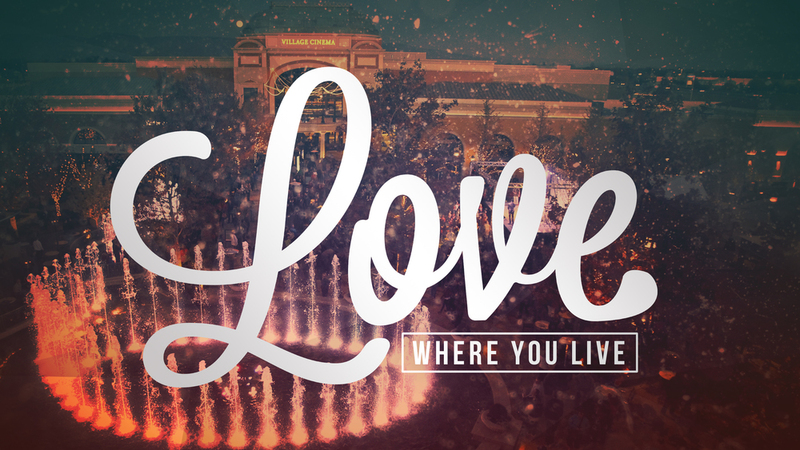 Don't miss this 6th installment of a great series challenging us to Love where we live. This is the Fifth week in our Love where You Live series, highlighting the vision, mission, and purpose of Central Assembly. We are committed to not only loving where we live because it is a great city to live in, but to LOVE where we live as well. People will know us by our love. At central assembly we are about Jesus People and the Pursuit of Both. Every person has value. They are made in the image of God and God has a plan and a purpose for their lives. In the story of Jacob and Leah, Leah is unwanted, unloved, uncherished and is told that she doesn't measure up to the standards of the day. She is constantly in the shadows of her sister and we read her story we see that the end is very different than the beginning. If you have every been told or told yourself that you simply did not measure up then you must listen to this weeks message. Because God loves you and has a plan for you life. Just like with Leah. Let God write your story today. I Love My Church BoiseCentral holds a lot of memories for us all. Some great, some sentimental, some sad, and some humorous but we all have them. What we want to do over these last few months in our current location, as we prepare for our new location, is to remember all the wonderful things that have happened in our lives here at 12000 Fairview Ave. WE don’t want to forget what God has done in our lives but at the same time we don’t want to forget that we are still on a journey in which God is leading us to new ground, new territory, new miracles, and new life stories that we will be able to look back on 10, 20, 40 years from now with just as much fondness as we look now to the 10, 20 and 40 years previous. So we want to have you post your pictures and your memories of the LIFE that has taken place here at Central Assembly over the last 40 years on Facebook, Instagram and twitter. We want you to let the world know that you love your church and we want you to share with them some of the significant moments in your own life that have been connected to this wonderful place we call church. We want you to let the world laugh, smile, and reminisce with you as you point them to the life that has been lived to the full with your family; your church family. BUT when you do post your pictures, videos, thoughts and memories, we want you to make sure you tag us in those pictures and posts so that we will be sure to see them and it will allow us to share them with others as well. You can do this by posting directly to our page (search boisecentral) on facebook or just tagging tagging us in your photos and posts using “boisecentral” on your facebook page. You can also do so by using "@Boisecentral” on twitter and Instagram. We would also ask you to use the hash tag #ilovemychurch and #boisecentral when you are posting as this will give us another way of seeing your memories and allow us to share in them with you. Each week we will have a theme that will be the focus of our posting. Whether that is “Weddings” or “Youth Ministry Mayhem” or Maranatha Memories what we want you to do is post your thoughts and pictures specific to that category. Each week we will put a new category forward. So each week we will have new material to remember, share, laugh, smile, and maybe even cry about a little bit, but each week it will be connected to the same general topic. We love our church, and I know that you do to. We can’t wait to see your pictures and hear about your favorite memories. We hope that you will share and share often about the great things that God has done in your life at this location but we also encourage you to use these testimonies as fuel to stoke the fires of excitement and anticipation for the memories to come. This is the fourth part in our Love Where you Live Series. Do you have a mission in life? What is your Goal? This week we launch into the first of our 6 Core Values. And it all begins and ends with the Cross of Christ. The message of the Gospel. Don't miss this powerful message in which we had several people give their hearts to the Lord. We also encourage you to continue looking for opportunities to love the people God has placed in your sphere of influence. Especially during the next 10 weeks as we are intentionally looking for ways to get involved in the I Love My City Campaign. Do you Love where you Live? Will You love where you live? We are excited to continue in this series where we look at the vision, mission, purpose and core values of Central Assembly. Pastor Ted shares this week about the mission of the church. We have also begun our 10 week challenge; the I Love My City Campaign. We challenged people last week to commit to doing one random (or planned and intentional) act of kindness for someone, once a week for ten weeks. With that we asked that they would given them one of the cards we had made that lets them know that they are loved and important and that we would love to invite them to check out boisecentral.org. With our whole church behind this campaign we will effectively invite a couple thousand people to visit our church through the website before Easter. Don't miss this opportunity to be inspired about the direction of our church, but more importantly, don't miss the opportunity to be inspired about what it means to love our city and to love people the way that God has called us to. As a side note, this last Sunday was Pastor Ted's birthday. We had a wonderful time celebrating him and his recovery. If you would like to wish him a belated Birthday we will make sure that he receives those messages. We hope you have a wonderful week and that you will seriously consider joining us in this 10 week challenge of loving the people of our city.